June 2008 - REDE/Critique JV was honored by having a plaque with the company logo flown on STS 124. The entire crew also signed a company t-shirt. In 2002 REDE was approved by the Small Business Administration as a Small Disadvantaged Business and that was the company's beginning. In 2003 the company was approved for the Mentor Protégé program and the first contract was a subcontract to HME for Facility Services at the Department of Energy in Oak Ridge TN. REDE's first prime contract was as a joint venture named REDE/Critique Joint Venture (RCJV). In 2005 RCJV was awarded the Administrative/Clerical Support Services contract and began providing administrative support services to NASA at Johnson Space Center and White Sands Test Facility. 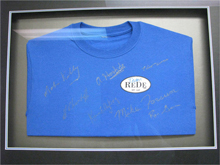 2005 was to be a banner year for REDE. The success of the JSC contract prompted NASA Stennis Space Center to offer another administrative support services contract to REDE. REDE was also given two sole source contracts - one with the US Department of Agriculture and one with the Department of Commerce - these were to provide assessments to the IG offices of each agency. Our first information technology work was as a subcontractor of SAIC at NASA JSC to support aircraft operations and astronauts. In 2007 we won our first commercial contract working with CenterPoint Energy In Houston. We also won a contract at DOE Oak Ridge for information technology support services, and in 2008 we were awarded our first institutional support services contract at Kennedy Space Center. This contract called for services ranging from administrative services to logistics to human resources support. Also in 2008, REDE was awarded a contract with the Environmental Protection Agency providing document management, scheduling and inventory management and general support services. In 2009 our administrative support services contract at JSC was recompeted and we were awarded the contract once again under the new name of JSC Administrative Support Services (JASS). This contract had grown from 70 FTEs to over 140. REDE has been able to assist our teaming partners by successfully leveraging our past performance in the key areas as shown on our Services page. We are able to help them with our insight into NASA and other federal agencies, and welcome an opportunity to work with other federal contractors who embrace their customer and share our employee values. REDE is celebrating the win of the Ames Financial Services Support contract as a team member of Logical-R Joint Venture. The contract officially started on March 1, 2015 and as a member of this joint venture, REDE will be providing administrative and financial support service to Ames.